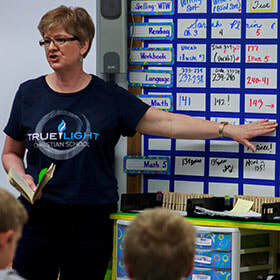 True Light Christian School trains students to grab truth and stand on what it says. Our staff trains students to hold on to faith despite how worldly culture changes. Weekly chapels teach the character of God and recognize students who demonstrate it. Students are exposed to missions, outreach, evangelism, and solid biblical teaching. 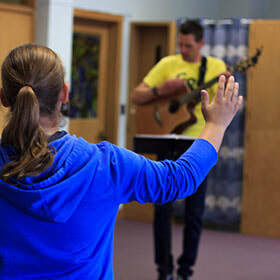 Staff trains students to lead prayer and worship by example and participation. Along with academics, students are taught the skills they need to radiate light into their circles of influence and the world. We teach a biblical worldview that is Christ-centered. We remind our students about their value in His Kingdom. 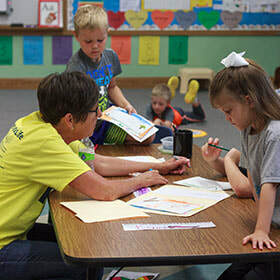 True Light Christian School teachers and staff are committed to Christ-centered education that positively impacts the lives of all who attend. Our staff is committed to modeling a Christian lifestyle, building relationships, and developing character in our students. We help students understand, apply, and grow in their gifts. The staff comes alongside students to help them grow in the Lord where they're at. ​By starting out each day in prayer and worship, our staff reflects the character of God and relies on the Holy Spirit to help them teach each individual student. Working at True Light Christian School and being a parent of students that have attended there has blessed us as a family. Kids are still kids, but the staff deals with all student and school work issues from a biblical standpoint. When someone is having a bad day, you see hugs and prayer happening. There is no greater reward than hearing parents' testimonies that their children have been using what they were taught and making an impact on others for the kingdom!